Fred Flintstone would be happy. Fossils of a duck-billed dinosaur were recently (relatively speaking) discovered in Alaska. What has scientists so excited is that the fossils support a theory that dinosaurs were able to live in a cooler climate than previously thought. From dinosaurs to DNA repair to fluorescent proteins, discoveries have shaped the scientific community for the better. And while little is often known about the utility of these advances at the time they are discovered, most scientists are usually optimistic about the future their new discovery holds. Sometimes they even base their entire careers on them. But discovering noncompliance within an air-quality compliance program is quite different. Such discoveries usually produce panic or anger, not rosy optimism. And that panic can lead to chaos. No one wants to deal with noncompliance, but the reality of it is that things do happen, and when they do, it’s important to know what to do next. Here are a few points to consider when figuring out what those steps are. 1. Understand the Requirements for Dealing With Noncompliance Within the Context of the Rules. This first step is the most important (first steps usually are) because different rules require that you deal with the incident in different ways. For example, was the noncompliance due to a mechanical breakdown? If so, then you need to review Rule 430, which covers breakdown provisions. If the noncompliance is due to something more significant, like not filing your annual emission report for the past 10 years when your emissions are 100 tons per year, then you may want to consider a self-disclosure proceeding. Such knotty situations call for bringing in all necessary parties, including — and especially — the management and legal teams. 2. Get All Requisite Parties on the Same Page. No matter how serious the incident, you should next review the facts with management and ensure that the expectations of key personnel are properly set. For example, what does the plant manager need to know if the noncompliance involves a self-reporting proceeding? What does the legal team need to know if a variance petition is needed? Whatever the case, you need to get the right people on the same page as a means to ensuring a coordinated effort. 3. Get to the Root Cause by Asking Why. Equipment Operator: We’ve experienced a mechanical breakdown. Equipment Operator: One of the parts broke. Equipment Operator: Dunno. Probably because it was old and needed to be replaced. Equipment Operator: Because Fred forgot to replace that all-important widget. Equipment Operator: I guess he didn’t have it in his calendar. Equipment Operator: Because he’s a disorganized mess whose mother still packs his lunch for him. You may think that asking “why” repeatedly is annoying, but trust me, you’re being productive — and you’re still more likable than Fred. Once you’ve identified the cause (and fired Fred), you can begin to design and implement systems to prevent the noncompliance from recurring. In this case, your new hire will be more organized and will make notes in his calendar about when parts need to be replaced. As a bonus, the more data you have about why the incident happened, the better off you’ll be if you need to discuss the matter with the regulatory agency. 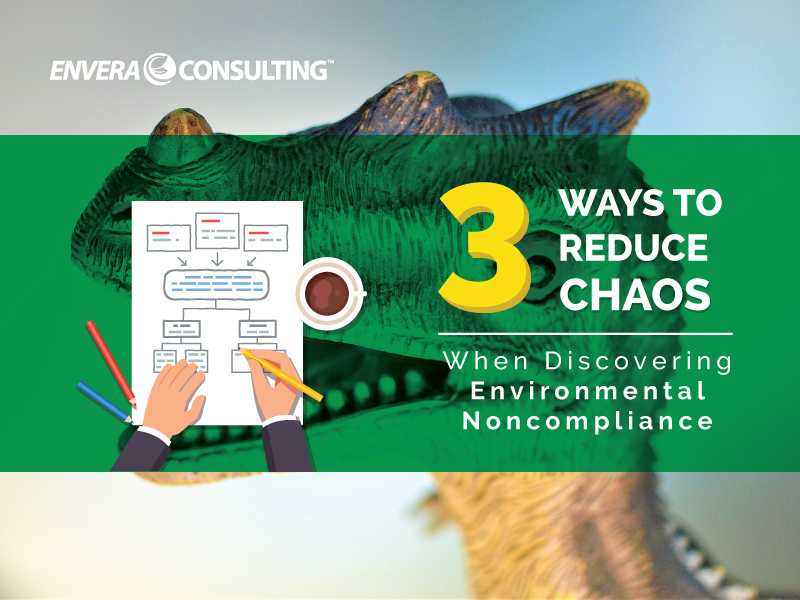 Discovering noncompliance doesn’t have to be chaotic. By following the three steps in this article, your next steps will be controlled, systematic, and calculated so that the best information can be obtained about the situation. And at that point, you really make progress. Yabba-dabba-doo!